There are some big changes happening here in Chula Vista. As you all may know, the Port/City of Chula Vista have already started the beginning phases of the Chula Vista Bayfront Re-development project. Within the next couple months, we will be saying our goodbyes to the RV Resort. 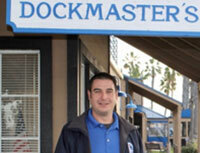 I would like to re-assure ALL our Marina tenants that it will be business as usual here at the Chula Vista Marina. We have already started the development of our new amenities via a remodel of the old Dolphins Restaurant site. These amenities will include a new gym, additional restrooms, and the outdoor patio area is being upgraded to create a new sunbathing area, BBQ’s, and patio furniture for gatherings / parties / events, music and TV’s. Once we open these new areas, we will then tackle installing a new outdoor Jacuzzi. Of course, existing amenities located at the marina will continue, as usual. The Dolphins site is a temporary “RV amenity replacement,” as we will pull out the stops when we build a NEW building complex as part of our Marina Port Lease Extension (estimated to start by the end of 2019). That complex will include an outdoor pool and Jacuzzi, tenant patio decking areas overlooking the marina with BBQ’s and meeting area for parties and events, boater’s lounge, new restrooms, laundry, gym, self-storage, offices, and a restaurant with decking overlooking the marina. If you have any questions or suggestions about our future plans, feel free to stop by the office. We are more than happy to share any info we have. December is finally here! It’s time to get into the holiday spirit and start diving into the family gatherings, holiday adventures, and travel plans. Yes, you got it, it is also time to think about and prepare for The Parade of Lights. This awesome event takes place every year on the bay. There are over 60 boats that really go all out in decorating their vessels with lights and Christmas figures. Last year, one of our tenants on M Dock, Dwight Everett, won 1st prize in the private-owned vessel over 46’ category. He decorated his 60’ Johnson Yacht named “Cute Stuff.” It really was a sight to see. The amount of work and detail he put into decorating his beautiful vessel was phenomenal. If you are interested in participating, this year’s theme is Tropical Island Christmas and will take place December 6th to December 16th at 5 pm. The parade will follow the same route as the previous three years. If you are interested in watching the parade, the Coronado Ferry landing is an excellent place to view the parade from. If you have not seen this event on the bay, mark the dates on your calendar. You will be in for a treat! James Yazloff came in on his awesome 32’ Blackfin Sportfisher Reel Salty from the Kona Kai Marina; John Hoffert sailed in his 35’ Santana Joyride from Marina Del Rey. Newell Wilson is back with his 25’ MacGregor Fast Sunday. Grant Wennerstrom and wife Donna Hephinger sailed in their 45’ beautiful Island Packett Vagabundo Dos from Oceanside. Francesco Licari sailed in his 25’ Catalina Sicilia from Harbor Island. Reiner Billingsley sailed in his 28’ Spirit from Driscoll’s Mission Bay. Nathaniel Cothran sailed in his 25’ Cornado Pualani from Shelter Island. Mark and Linda Baht just purchased a 45’ Grand Mariner Restless already here at the Marina. Vien Lam brought in his 35’ Silverton Tool Time from California Yacht Marina. Tony Zarola and Barbra Louis purchased a 35’ Roughwater already here in the marina. Brandy Brandes purchased a 35’ Silverton here in the marina. Welcome one and all! All pets must be kept on the vessel or on a leash at all times. Tenant shall also be responsible for cleaning up any “pet mess” left on the docks and Marina property. Please help yourself to our pet friendly bag and disposal stations at each gate. Maintenance: Tenants must maintain their in a clean and cared-for condition at all times. On the docks, no hull sanding, paint removal, spraying or scraping can be performed. Major construction or repair, painting or overhaul must be done elsewhere, preferably a boat yard. Workers hired by you to work on your vessel must be approved by the Marina prior to commencement of any work. Each such person/contractor must have a valid business license and must maintain/provide proof of liability insurance in an amount of at least $500,000 and workers compensation coverage for employees. All such insurance must name Chula Vista Marina as additional insured. Passes can be issuesd from the Marina office for your overnight guests. No Motor Homes, Campers, Trailers, or All pets must be kept on the vessel or on a leash at all times. It is a sight that everyone must see at least once. The Resort transforms into a Winter Wonderland with RVs all decked out in their Holiday finest. There are lights everywhere and I mean everywhere! The Happy Campers will be here for their 17th year! Their group of exuberant and gleeful people ensures that this is one of the best weekends of the year. It is the last chance you will have to see this spectacular event. While you’re enjoying all the beautiful lights in the RV Resort, stop by the Poolside Room for some festive holiday candies. Admission is a donation for Marine’s Toy for Tots – for each donation you will receive a raffle ticket. At 6 pm we’ll announce the winners of the decorating contest as well as the raffle winners. It’s a great way to share the reason for the season. Join us in the RV Poolside Room for a Christmas Potluck. The Resort’s elves will be preparing the glazed ham and their famous cheesy potato casserole. You just need to bring a side dish to share and your holiday cheer. Don’t forget to sign up in the RV Central Complex, so that the elves know how much ham to cook. It will be great time for all! Marina Classes are free to CVM tenants and members of CG Auxiliary and US Power Squadron. For all others there is a $10 fee. For more information call the Marina Office at 619-691-1860 . This beginning boating class provides the knowledge needed to obtain a California Boater Card. This is a terrific class for new boat owners. Topics include types of boats, trailering, navigation, boat handling, boating problems, safe boating, hunting, fishing & water skiing and more. This is an 8-hour class 9:00 am to 5:00 pm the fee is $35. There is limited seating so sign up now. He is approved for CA Boater Card. Instructor Bill Anderson U.S. Coast Guard Auxiliary. 619-922-0231. Stan O’Hoppe will be giving a seminar on how to effectively quit smoking cigarettes without the use of any E-cigs or gum. NO GIMMICKS - Just an effective way to stop smoking. Save your health and save the environment. Vessels passing safety checks are awarded a U.S. Coast Guard / Auxiliary Decal that informs: Coast Guard/Auxiliary, Harbor Patrol, Sheriff's & Police other boating law-enforcement & safety agency's that your boat was in full compliance with all Federal and State boating laws during a safety check for that year. Best of all every Vessel Safety Check is 100% free of charge! Class starts at 9 am; Vessel inspections start at 10 am. Why Receive a Vessel Safety Check? Safety! The peace of mind that your boat meets federal safety standards and that in an emergency you will have the necessary equipment to save lives and summon help.